The search for the best espresso machines can seem like a never-ending chore. Getting that rich taste and full crema cap when you want it is difficult without a good home brewer. Finding the right one is something well worth your time and effort. The Super Automatic espresso machine under 1000 will be a machine that will make you an extremely good cup of espresso. It will be attractively finished, able to look at home anywhere. It will be made of high-quality materials. It will have nearly every feature that a good espresso machine can have. The best espresso machines represent some of the finest espresso makers on the market today. Each one is well loved by its many users. Each one has a number of useful and luxurious features that make brewing up your own espresso a joy. I think that any coffee lover would be pleased to own and use any of these brewers. One of the Best espresso machines is a classic in its own time, the BES870XL Express is a newer version of a heritage machine. It is well-known for making good espresso quickly and easily. Both new brewers and lifelong coffee snobs will be pleased with the features of this machine. The Express is not a small machine. It measures 13.2 inches tall by 12.5 inches wide by 15.8 inches long. It weighs a solid 23 pounds. It comes with a typical one year warranty with free replacement shipping. Breville understands that crafting the perfect cup of espresso is a blend of art and a bit of science. With that in mind, the Express allows the user to experiment. You can use double walled pressurized filters for easy to optimize extraction. When you feel like getting more creative, you can try the single-walled filters that let you play with different ground sizes, different tamping methods and different amounts of ground beans. This is the best espresso machines that can easily last for years. Everything from the burr grinder to the outer casing is built with top of the line materials. The stainless steel casing is sold in burnished steel-gray, or with red or black-coated accents. It is easy to clean. The unit has a removable drip tray and a neat little hideaway compartment for the included cleaning tools. Conical Burr Grinder with a half-pound bean hopper. Everyone knows that fresh ground beans make a better cup. Just letting the ground beans sit for just a few days decreases the amount of crema that you will get. This handy chopper makes it easy to get fresh ground beans on demand. Select your grind. We know that different grinds give different results. This machine makes it easy to select the grind size and amount that you get. 360-degree steam wand and auto purge function. Perfectly frothed milk for your perfect espresso. Handy ‘Clean Me’ light for the machine and ‘Empty Me’ for the drip tray. They even give you a cleaning kit! Uses Thermocoil heating technology. This is one of the most accurate water temperature control systems today. Even water temperatures are necessary to get a smooth flavor. Programmable volume control. I really like this feature. You can select from one or two cups. You can use a manual override. Or, you can program your own amount. Automatic filter fill-up. Just put the portafilter in the cradle, select your settings and relax. Huge 64-ounce removable water tank. A tank is top filling and has a built-in filter. Filtered water makes for a smoother, more reliable taste. Uses a 54mm tamper that is magnetic for easy storage. For once, the best espresso machines that lives up to its name! The Magnifica really is magnificent. It is the kind of machine known as an automatic brewer. This means that you can simply push a button. After a few minutes, you’ll have a great espresso. Owners of this machine compare the quality to what you’d find in a good cafe in Italy. It has the standard Delongi two-year warranty. You will have to stock it with beans or grounds, of course, but it does all the heavy lifting for you. 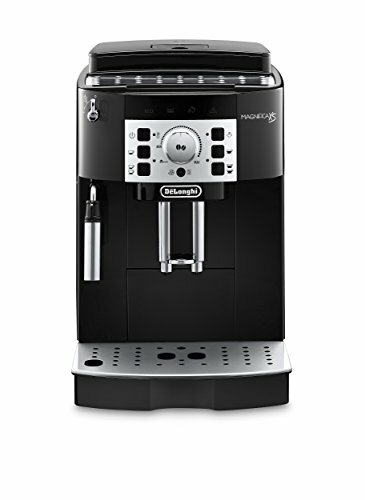 It is a larger machine, but DeLonghi has attempted to lessen the footprint. All of the controls and features are located on the front of the machine. It measures 17 inches by 13 inches by 18 inches. It weighs a little under 29 pounds. This is the best espresso machines that boasts the smallest removable brewing system sold today. The small boiler and compact system mean that your brew is protected from temperature shifts during the process. The removable stainless-steel double boiler makes this machine easier to clean, which I always find a bonus. While the espresso machine is automatic, you still have plenty of control. You can choose between stronger and weaker brews. You can also change how much water is used. The seven-ounce bean container and 60-ounce water container are nicely tucked out of sight. The grinder is fairly quiet and very reliable. Beans to Brew system. The hands-off brewing method makes a great cup of espresso without you having to do much with the machine. You push a few buttons and it grinds, tamps and brews. This is a great time saver for those busy days. Built-in burr grinder for freshly ground beans. The fresher the bean, the better the aroma and crema. You can’t get much fresher than what this machine uses. Now, they do recommend that you use non-oily beans for best results with this system. Cappuccino system steams and froths milk perfectly. The wand is adjustable to fit your milk container. Adjustable coffee spigots make using all sizes of cups easy. Cafe style cup tray. The cup tray is heated, preventing flavor change from hot espresso hitting a cold cup. Instantly reheats the core of the machine after a brew. This feature lets you quickly make several cups of espresso. The reason why I like this DeLonghi Esam 3300 is, there is nothing bad to say except for except for minor but it can easily solvable pressure issues. DeLonghi Magnifica xs is the best espresso machines who demand real Italian taste, but who don’t have two acres of kitchen counter-top to spare. This is the smallest of the three machines at a mere 9.4 inches by 17 inches by 13.8 inches. It is still pretty heavy at 20 pounds. Despite its small size, this is a fully featured automatic machine. It’s also a nice looking machine. Sharp looking black and stainless steel features give it an unassuming but professional appearance. It has the standard Delongi two-year warranty. The little Magnifica XS does all the things that its larger sibling does. You get the beans to brew patented brewing system. You get a great Italian style espresso at the push of a button. This brewer is also designed to be easier on the planet than larger machines. It uses a fast heating single boiler system with an energy-saving setting. 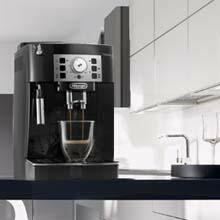 The Magnifica XS has five pre-programmed coffee strength settings to please nearly every coffee lover. It also has four water settings. If you are feeling more adventurous, you can use the manual settings to individualize your cup. Every feature is found at the front of the machine. While this machine is smaller than many high-end espresso machines, it is still fairly big. Having every feature at the front lets you squeeze it into smaller spaces. Customize your cup. Most of us will be happy with the plethora of adjustments the machine has pre-programmed in. Intuitive design. It has a lot of options. Anyone who has ever used an Italian machine will quickly see how to set up its features. Those of us unlucky enough to never have used an Italian machine before may want a little more practice. Fully automatic system. The machine will let you know when it needs the bean hopper refilled, when the water is getting low or when the waste grounds need to be emptied. Most users will find they get around ten cups before it needs any attention. Programmable water hardness feature. The machine comes with test strips that let you tell your machine just how hard or soft your water is. This neat little feature helps you maintain the machine over the long haul. I think I’m safe saying that these three machines will all give you some of the best espresso you are likely to taste outside of Rome. They will also let you enjoy your brew in your favorite fluffy slippers, unlike a trip to Rome. 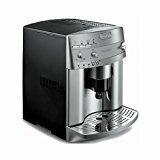 Picking the best espresso machines under 1000 dollars for you could be decided mostly on how much space you have and how hands on you like to get with your brew. The Breville Barista allows you a little more hands-on activity. It also has a larger water tank and can hold more beans. You will be required to tamper your own grounds. You will also have to think a little more about your pressure to grind ratios. This is a machine that allows you to enjoy the process of brewing as much as it lets you indulge in a great cup of coffee. Both of the Delonghi machines are automatic brewers. They remove the hands-on brewing fun. They also take out the trial and error of getting everything right. Automatic brewing also feels faster. It takes roughly the same amount of time to get your cup of coffee, of course. Now you could chase after kids, or catch up on the news instead of fiddling with your drink. Which One is Best For Under 1000 Dollars? When you are buying a high-end machine such as these, you expect certain features. All of these machines deliver. They are well made, with quality materials and excellently crafted mechanical parts. Nice touches like cleaning alarms and built-in grinders are standard. There are a few differences in the warranties. The Delonghi machines have a two-year warranty that covers nearly anything that could happen. 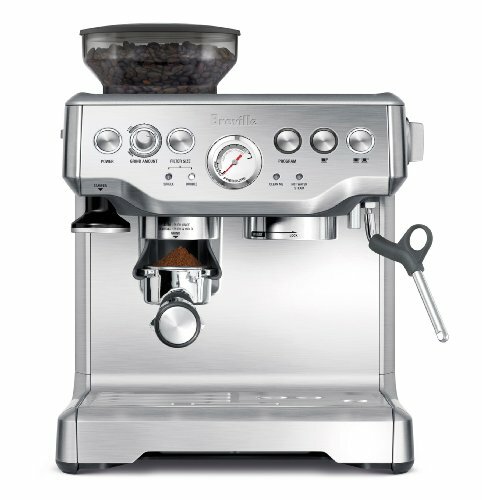 The Breville Barista has its manufacturer’s one year warranty that also offers great service. Breville also offers free shipping to and from the repair facility. The Breville Barista and the ESAM3300 Magnifica are machines that have been around for a few years. The technology has been tested by many coffee lovers using these machines in their homes over time. The Magnifica XS is a newer machine. It hasn’t had that same kind of long-term vetting. There are also a few size differences to consider. The Breville and the larger Magnifica are roughly the same size and shape. The Magnifica XS has the smallest footprint of the three. It’s still not that small. If you can fit a typical large American pod brewer in your space, then you should be able to fit the XS espresso machine. If space is really tight, I’d suggest measuring before ordering. I will not try to tell you which of these the best espresso machines under 1000 you will like best. I can only offer my opinion. These are three very fine machines. I’d be very happy with any one of them gracing my kitchen counter. When I set out to find my favorite of the three I thought hard about size, features, and ease of use. I really like the experimentation that the Breville Barista offers. I also like that this machine has been around for a long time. By now I know that the manufacturer has worked out any kinks in the system. This is a quality machine with a great heritage. The machine is also quite large. It’s also messier than the other two. The Delonghi Magnifica is another fine, large machine. It’s also neater to use than the Barista. I don’t always want to fuss with grounds. With this machine, I don’t have to do that. But, it’s a bit too big for me. I prefer the newer and somewhat smaller Magnifica XS. It has newer technology, the same ease of use and fits in the space I have.